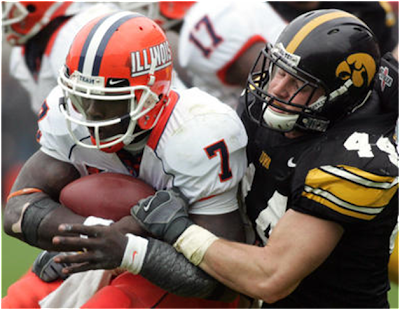 In this 2007 photo, Iowa linebacker Mike Humpal tackles Illinois quarterback Isiah Williams. Former Iowa linebacker Mike Humpal will serve as the Hawkeyes’ honorary captain during Saturday’s game against Ball State at Kinnick Stadium. Humpal was a co-captain for the 2007 season, and the shared team most valuable player honors with running back Albert Young that season. Humpal was a two-year starter and four-time member of the Big Ten Conference’s all-academic team. As a senior he led the Hawkeyes in tackles with 123. That figure is the 27th best seasonal tackle total in Iowa history. He led the Big Ten in tackles per game (11.8) in 2007. The New Hampton native had 197 career tackles and six interceptions. He played in the 2008 Hula Bowl and was drafted in the sixth round of the 2008 NFL draft by Pittsburgh. Humpal will accompany the Iowa captains to the center of the field for the pre-game coin-flip. He will also be with the Hawkeyes in the locker room before and after the game and on the sidelines during the contest.